Have you suffered an injury as a result of carelessness or negligence of another person? In the aftermath of a personal injury, we end up feeling overwhelmed. In fact, the majority of individuals find it hard to secure proper health care services for their full recovery, or even become unable to continue with life. Why should you be the one suffering from an injury that resulted from the recklessness of another person? This is why you need the expertise of a professional Orlando Personal Injury Attorney to ensure that you do not suffer for another person’s mistake. At Leo Trial Group, we work with a team of expert, well-trained lawyers that know all it takes to handle a personal injury case. We are always ready for strong, effective legal action against Personal Injury. We are always ready to help you get your life back on track if all it takes is first class legal representation for your personal injury. Let the attorneys of the Leo Trial Group help with your personal injury case. We help various personal injury victims to get their lives back on track. We believe that you should not be the one suffering for another person’s negligence or careless. This is why we are ready to pursue your case aggressively with enough evidence and financial backings. As your Personal Injury Attorney in Orlando, FL, we will ensure that you get substantial compensation, and top-notch health care services for your full recovery. Our team has vast experience and expertise in handling Orlando personal injury cases. These case involve intricate details and, often, complex legal terms and litigation. Rather than handling your case on your own, you can trust our legal team, including our Orlando personal injury lawyer, to get you the best results. With lots of experience as lawyers in taking up a personal injury case as well as workers compensation cases, including slip-and-falls, dog bites, burns, car accidents, and lots more, our lawyers at Leo Trial Group understand the deeply personal and individual nature of a personal injury case. This is why we are always ready to provide adequate resources and go the extra length to ensure that justice is well served. As your Personal Injury Lawyer Orlando, we recognize our responsibilities to both our clients and the community at large. While other lawyers may prefer to pass your case to a paralegal or an investigator, all your personal injury cases will be expertly managed by our competent team of lawyers. Each case will be managed with an outstanding level of professionalism and expertise. Often times the majority of stress arising from an Orlando personal injury case can arise from not understanding the process well enough. 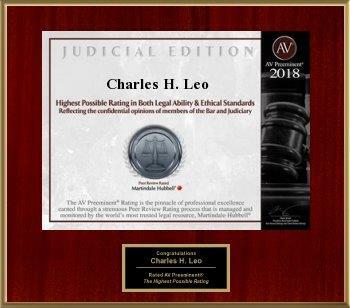 The law offices of Charles H. Leo are here to help in this area. We will provide you with the same service we would extend to our friends or family. From day one, our legal team will ensure that you understand each step of the process along the way so that you are not left in the dark at any point during your litigation. As your Orlando personal injury lawyer, we will only charge you if the case is won. In addition, we will provide you with an initial consultation free of charge so that we can determine the possible outcomes of your particular circumstances. In case you are a victim of personal injury or you know a relative who is, you or the person deserve the best legal representation. Hire the attorneys of the Leo Trial Group as Personal Injury Attorney Orlando and you are guaranteed to get top class legal representations. We are always ready to fight for you and help you get what you are entitled to. We operate on a contingency fee, meaning that we will not collect unless you do. We will provide aggressive litigation and remove the hassle of the courtroom for you. For more information on our services or a free consultation, call us today at (407) 839-1160 or (866) 804-1160. We will aggressively pursue the maximum settlement for your case. Can Truck Drivers Get Workers’ Compensation? Copyright © 2019 Leo Trial Group. All Rights Reserved. Design and Marketing by Orange Rock Media.